In our Firefly home we continue to bring up those children rescued in the quake, including two babies Bhu and Ma. It has been wonderful to do our bit in the aftermath of the quakes, whose impact continues to affect the nation as a whole. The numbers of students attending school in Nepal have dropped dramatically since the big quake. This is due to many parents requiring the help of their children to perform tasks such as looking after smaller children, going out to work, farming the land, helping with chores. Many people have experienced a huge loss of income and require their children to assist. At Firefly we are happy to prioritise our children’s education, thanks to the help of our sponsors! The children really do love learning and can’t wait to feed their minds 6 days a week. It is beautiful to witness them cheerfully getting ready for school every morning and happy to complete their homework. We have opened up our onsite school to other children in the surrounding village who would otherwise not be able to get an education. This is also very good socialization for our Fireflies. Living in an orphanage does have some stigma attached. All the children are about to sit their final exams in the next two weeks. The new school year begins in April after a short holiday. One of our lovely teenage boys Sabin (left) has a life-threatening heart condition so we have been putting money towards his operation. The surgery is not free in Nepal and Sabin requires surgery soon. If you would like to donate through the usual channels, please do. Santosh (right with Amanda) is one of our very social and sporty teenage boys who is looking at going into hotel management. We are sending him on a course once the school year finishes. This line of work will create wonderful opportunities for him, both in Nepal and abroad. 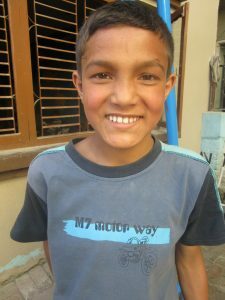 Santosh has no parents and came to us when he was 6 years old. In a crazy world, there is a lot of hope. One just has to look at the progress of our Firefly children. There is also some amazing teams of people heading into Nepal this month and next, who are going into remote areas affected by the quakes to build schools and homes. Thankfully, a few of them are dropping by our home on their way, to donate second hand clothes and much needed stationary. A heartfelt thank you! If you require any information, please contact me. Thank you for your continued support. My work is nothing without your help! Thanks for the update. Your doing a great work and it’s encouraging to see the reports. I think the work you and your team do is truly amazing! When I think of all the (unimportant!) things I worry about each day it is very grounding to get your newsletters and see the smiling faces. I would like to wish Sabin all the best regarding his pending surgery and Santosh with his upcoming hospitality course.